It seems like such a simple thing: Track what you spend your money on, and then you’ll figure out how to set a budget. But if you don’t have a good system for tracking your expenses, it will be hard for you to come up with meaningful data from which you can make better decisions on how to spend your money. Paper and pencil. In college I jotted down everything I spent money on in a little notebook and then tallied it up at the end of each month. This was easy because I could carry the notebook in my purse and write down my expenses as they occured. The downside is that there wasn’t an easy way for me to break down expenses by category. Later I started using the free printable Monthly Spending Worksheet from BetterBudgeting.com. I liked that I could see spending by category and by week. I would use smiley faces or frowny faces to make a note of whether spending in a particular category was up or down in comparison to the previous month. Those smiley faces were motivating! Spreadsheets. You can create your own spreadsheet on your computer, but I prefer finding free budgeting spreadsheets from Google Docs. I like that the spreadsheets do all the math for you, but having to sit down at the computer and enter everything in became a bit of a hassle for me. And sometimes the spreadsheets were tough to customize for our particular financial situation. Apps. We’re pretty gadget-heavy at our house, and we love apps. Do a search on your iPhone or Android device for budget software, and you’ll find plenty free budget and expense tracking options. Some folks swear by Mint.com, but I’m really uncomfortable sharing my personal account information and data. Instead, I’ve been using Budgets Free (with Sync) for the iPhone and Budgets for iPad Free for a couple of months now and they have been extremely helpful. (There are paid versions that are ad-free, but the free versions are fine). I like that you can sync the data between devices using these two apps, so I can track my expenses with my iPhone on the go, and then sync them on the iPad and be able to share our finances with my hubby on a larger screen. The ability to put all the data I’ve entered into a visual that provides me with meaningful information has been highly motivating. I started tracking our expenditures again after falling off the frugal bandwagon last year. I’ve revisited this tracking exercise several times in my life, and each time, I find it immensely helpful. 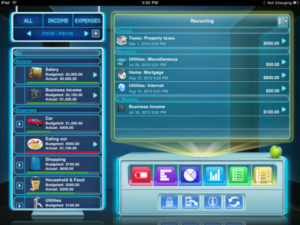 With all of the options out there, tracking expenses is not as much of a chore as it once was. What I had forgotten, however, is that tracking can awaken some guilt. When you write down that $4 latte or that $15 blouse or that $40 dinner at a restaurant, you’re going to have to face your truth. There is no more denying why you’re broke. You can see it right there in the numbers in red. You can find see which categories are completely out of line with your income. You can see your mistakes. I’m still learning how to stop beating myself up over those financial blunders. That’s something for another post. But I am still very thankful that I am taking the time to track my spending and to map out a budget. It has helped me better define needs vs. wants. It has helped my family get a clearer picture of what things we value. It has made it easier to say “no” to little wasters of our money. And we’re getting closer to back on track. Now it’s your turn: How do you track your spending? Anyway, it works. As long as I put my expenditures into it. Sometimes the old school methods work the best! I think Money may not even be active anymore, so you probably don’t have to worry about the “connect online” feature. Makes it even safer! I’ve been tracking since last year using spendingdiary.com. Free, easy and you don’t have to share your personal info — nor does it have some other features about Mint that annoyed me when I tried it. This year, I’m combining the info from that source along with budgetsimple.com — which allows me to create, you guessed it, a budget. Those sites are new to me, Joanna. I’ll definitely be checking them out, too! I love resources that don’t require your account info. Thanks for the useful article and comments as well.